Carex radiata plants. Gary P. Fleming. Digital Atlas of the Virginia Flora. Virginia Botanical Associates, Blacksburg vaplantatlas.org (Accessed 12/2014). 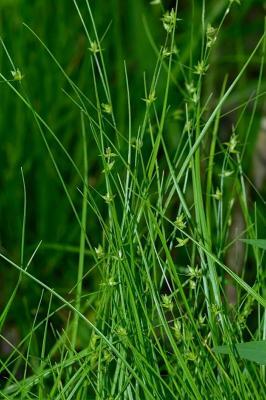 Carex radiata is a perennial, densely tufted sedge, fertile stems fine, to 80 cm long, 0.8-1.5 mm thick at base. 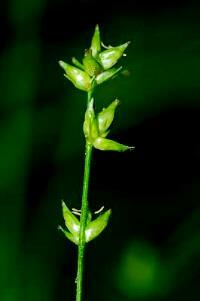 Leaves elongate, to 1.9 mm wide; bracts very thin, the lowest often longer than flowering stem. Carex radiata.Gary P. Fleming.Atlas of the Virginia Flora Virginia Botanical Associates, Blacksburg. www.vaplantatlas.org. (Accessed 12/2014). Flower spikes small, 4-7, sessile (stalkless), spike closely aggregated or lower ones separate; male flower spikes at top, scale below each flower shorter than perigynia, rounded to acute at tip, greenish; female flowers (perigynia) pale green, widely spreading to pointing downward, one side flat, the other convex, 2.6-3.8 mm long, base blunt, spongy, veins obscure, tip short-beaked, 2-toothed, margins rough; achene (seed) lens-shaped, not filling the lower part of the perigynium; stigmas straight to somewhat twisted. blooms mostly May-June. Notes: Extremely difficult to tell from C. appalachica or C. rosea. Often grouped under C. rosea complex (G. Moore personal communication).